Picture 5,500,000 colorful balloons floating in the air. A seemingly endless vibrant sea of balloons. Then imagine all of those 5.5 million balloons popping simultaneously. Now comes the sad realization that those balloons are a metaphor for the more than 5.5 million people worldwide that are dying prematurely every year as a result of air pollution, as reported by BBC News. Unfortunately, it’s not just air pollution. 14,000 deaths per day are caused by water pollution due to lack of clean drinking water and proper sewage systems in underdeveloped countries. If you think the problem only exists in third world countries, unfortunately you’re wrong because over 200,000 Americans are killed annually by various forms of pollution. This is a serious topic and some may be wondering what exactly defines pollution? “Pollution is the introduction of contaminants into the natural environment that cause adverse change and it can take the form of chemical substances or energy, such as noise, heat or light.” With the factory boom from the Industrial Revolution came the aftershock of environmental pollution as it is today— dangerous carcinogens in our air, unsafe particles and untreated hazardous chemicals in our water. Although the death tolls from pollution are eye-opening, they don’t tell the whole story. Last year the World Health Organization compiled a list of the top ten cause of death from, “environmental risk factors, such as air, water and soil pollution, chemical exposures, climate change, and ultraviolet radiation. It’s important to note that the majority of deaths were caused by cardiovascular and respiratory diseases because pollution affects our health over time. 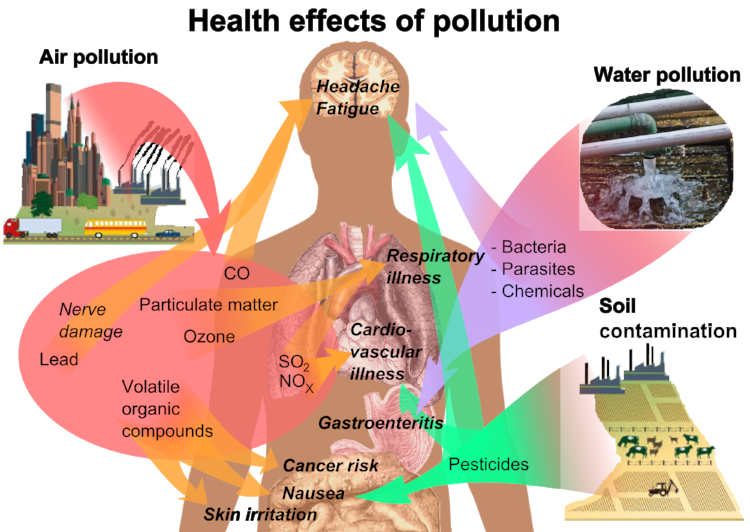 Continually breathing in air laden with carcinogens and even living in a polluted area has acute and chronic effects on your organs and various systems. Not to mention, the world counts reports that swimming in a polluted beach or lake can cause rashes, hepatitis, gastroenteritis, diarrhea, encephalitis, stomach aches and vomiting. Marine life is a critical source of food around the world; water pollution is directly killing our marine life and in turn, hurting us. Our food from the ocean isn’t the only food source being effected, vegetation is also impacted by air and soil contamination-- but this is a topic for another time. Not only does pollution make our planet look ugly, it negatively affects your health. To solve a problem, you must first be aware. Now that we know the true costs of pollution, it’s time we take matters in our own hands.